China’s Wenjing Sui and Cong Han perform their Free Skate at the 2019 World Figure Skating Championships. The Pairs event concluded at the 2019 World Figure Skating Championships with the Free Skate on Thursday. China’s Wenjing Sui and Cong Han moved up from second to win their second gold medal at this event after a record-breaking free skate. Evgenia Tarasova and Vladimir Morozov of Russia earned their second consecutive silver, while teammates Natalia Zabiiako and Alexander Enbert moved up one spot to win the bronze—their first world medal. 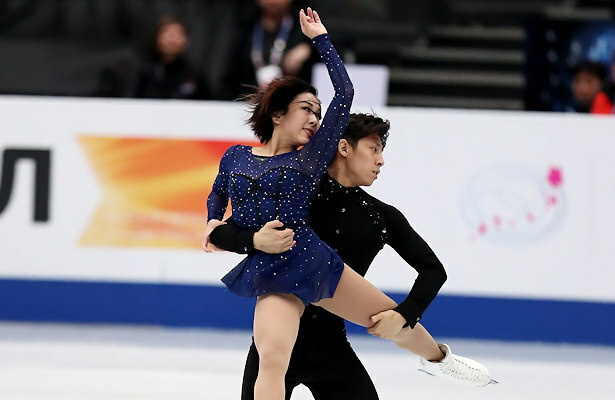 Sui and Han mesmerized the audience with their haunting and ethereal routine to “Rain, In Your Black Eyes.” The 2018 Olympic silver medalists were solid, giving the best performance of their short season with a record-breaking free skate score of 155.60. The five-time and current Four Continents champions opened with a triple twist followed by side-by-side triple toe-double toe-double toes and throw triple Salchow. They also produced solid side-by-side triple Salchows, a throw triple flip, and their triple twist was graded a level 4 as was all the lifts. The moved up from second after the short to first overall with a total score of 234.84. Tarsova and Morozov delivered a powerful routine to “The Winter” by Balmorhea in which when Morozov put a hand down on the side-by-side triple Salchows as well as after the first jump in the side-by-side triple two-double toe-double toe combo. Those were the only two mistakes, but they were costly. The European silver medalists otherwise landed a throw triple Salchow and throw triple loop and earned a level 4 on all elements, including the triple twist. They earned a earned a new season’s best of 147.26, finishing second in the free skate and overall (228.47). Vanessa James and Morgan Cipres of France bounced back after a subpar short to finish third (146.52) in the free skate after their dramatic routine to “Wicked Game” and “The Last Feeling.” The 2019 European champions were not perfect as James doubled the first jump in the side-by-side triple toe-double toe-double toe combo and later put a foot down on a throw triple Salchow. However, they produced solid side-by-side triple Salchows, a triple twist and a throw triple flip while displaying difficult level 4 lifts and spins which was reflected in their component score. With a total score of 215.19, they rose from seventh to fifth overall. Zabiiako and Enbert produced a dynamic routine to “Toi et Moi” which featured solid side-by-side triple toe-double toe-double loops and triple Salchows, a throw triple flip, and a throw triple loop. The 2018 NHK and Helsinki champions also earned a level 4 on all elements except for a level 3 triple twist for a new season’s best of 144.02, finishing fourth in the free skate and third overall (217.98). Missing the 2019 European championships was disappointing but served as motivation for the Russian silver medalists who teamed up in the spring of 2015. Cheng Peng and Yang Jin of China, who stood in third after the short, were were nearly solid with the exception of a underrotated triple jump by Peng on the side-by-side triple Salchows. Their routine to “La Vie en Rose” othwerwise featured side-by-side triple toe-double toes, a throw triple loop, throw triple Salchow. The 2019 the Four Continents bronze medalists 140.33 for a fifth-place in the free skate and fourth overall (215.84). Russia’s Aleksandra Boikova and Dmitrii Kozlovskii put out an enchanting routine to The Nutcracker to earn a season’s best of 140.31 in the free skate. The 2019 European bronze medalists landed side-by-side triple Salchows and triple toe-double toe-double toes, a throw triple Salchow and throw triple loop. With a total score of 210.30, they finished sixth overall in their debut at this event. The Russian bronze medalists would also love to be invited to the exhibition. Italy’s Nicole Della Monica and Matteo Guarise had a step-out on the side-by-side triple Salchows, as well as a turn out in the triple toe-double toes, but the 2018 Rostelecom silver medalists produced a triple twist, throw triple loop and throw triple Salchow in their “Tristan and Isolde” routine. They finished seventh in the free skate (128.45) and eighth overall (195.74). Kirsten Moore-Towers and Michael Marinaro of Canada struggled on their side-by-side jumps, and Moore-Towers put a hand down on a throw triple Salchow in their performance to selections from Pink Floyd to finish eighth (126.94) in the free skate. With a total score of 200.02, the Four Continents silver medalists slipped from fifth to seventh overall. USA’s Ashley Cain and Timothy LeDuc and Miriam Ziegler and Severin Kiefer of Austria rounded out the top ten.